At ServiceMaster First Response we hold ourselves to the highest of cleaning standards. This week we had the opportunity to aid another local business with their office furniture. The image to the left is of a waiting room chair. To the naked eye everything looked in order, however once we took a closer look we found all evidence to the contrary. Under 800x magnification we found all manor of dirt and debris that had worked its way deep into the upholstery fibers. The furniture was then handed off to our highly skilled upholstery cleaning technician. 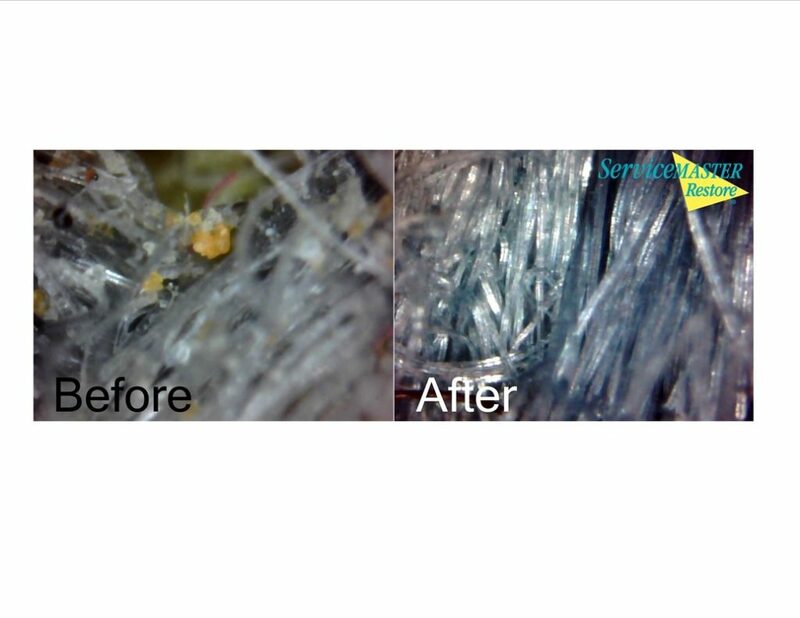 Once thoroughly cleaned and dried [right], we again dove down into the fibers to assess the situation. As expected, there was not a speck of dirt to be found. If you have upholstered furniture, it is a good practice to have those items cleaned on an annual basis. Regular cleaning can help to prolong the life and appearance of your furniture. If you would like to know more please feel welcome to contact us. Thank you! « We Clean Up What Plumbing Leaves Behind.